name alone. If it also has a good storyline and an appealing cast of characters, there's a chance it might rise above fad status, and become an enduring cultural artifact — and that's exactly what the Turtles have done. 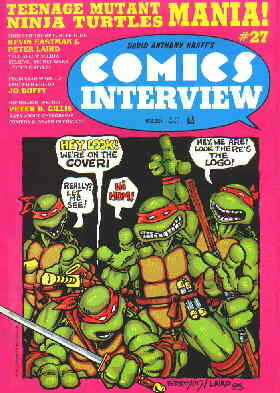 Kevin Eastman and Peter Laird had been collaborating in comics for a couple of years without notable success, when, while working on something entirely different, they started batting ideas about weapon-toting turtles back and forth. By the time the conversation was over, the "Teenage Mutant Ninja Turtles" concept had been completely worked out. The Turtles are Michaelangelo, Leonardo, Raphael and Donatello. They became mutants following one of those superhero-spawning accidents you see so many of in comics. In fact, this particular accident apparently had spawned a superhero — it was staged to look as though the radioactive canister that had given Daredevil his super senses had then fallen into the gutter and mutated four escapees from a pet store. They became ninjas through the training of a rat named Splinter, who was strongly reminiscent of a character named Stick, from Frank Miller's version of Daredevil. And they became teenagers through the simple passage of time. Turning the concept into an actual comic book story involved considerably more effort than simply dreaming up the name and situation — and, since it didn't seem the sort of thing Marvel or DC would go for, getting the comic published took more effort yet. They wound up doing it themselves, using the name "Mirage Studios" as their publishing imprint. To finance the initial run of 3,000 copies, they used tax refunds, emptied bank accounts, and borrowed money from Eastman's uncle. They were hoping to at least break even, while providing themselves with a portfolio piece. Instead they became millionaires, as proprietors of comics' biggest hit since X-Men. The first issue's second printing was twice as big as the original one; and the third was bigger yet. Within a few months, new issues were routinely being printed in quantities of 50,000 and up. Then came Mark Freedman. Freedman was a licensing executive, who first heard of the Turtles in 1985 from Palladium Books, which had just started publishing them in the form of a role-playing game. From the name and the basic concept, he knew it had "International Phenomenon" written all over it. Before long, Turtles T-shirts, Halloween masks, coffee mugs, and all kinds of other paraphernalia were appearing in stores. The merchandise really took off in 1987, when the animated version started on television. The animated Turtles remained in production for an entire decade, then started again in 2003. In 1988, Archie Comics licensed the TV version, giving fans a second track of Turtles stories in comics — Mirage Press continued to publish them in black and white for a mostly-adult audience, while Archie did them in color, aimed at kids. A third track was added on December 10, 1990, when Creators Syndicate (Miss Peach, Baby Blues) launched the Turtles' daily newspaper strip. Tho the Mirage series moved to Image Comics (Spawn, Witchblade) in 1996, when Eastman and Laird stopped doing their own publishing, all three ran side-by-side for years. In 1990 the Turtles, like Howard the Duck before them and Inspector Gadget after, starred in their first live-action movie. Nowadays, they're available as video games, read-aloud books, and a very wide variety of merchandised products. Since then, their popularity has waned somewhat — but even after a couple of decades, they are very much a part of America's popular culture scene, with a new animated version beginning in 2003. Not bad for a self-published black and white comic book that came out of a single bull session. Text ©2001-06 Donald D. Markstein. Art © Mirage Studios.